The Academic Bistro lunch program run out of the Center for Food and Hospitality Management is once again serving up a deal that diners can’t refuse. For just $12, visitors to the Academic Bistro can have a three course meal, with coffee, tea and soda included, right here on campus. The Bistro operates on Thursdays and Fridays in conjunction with two sections of the classes who put the whole thing together. Drexel students enrolled in either Chef Jim Burke’s commercial food production class or assistant clinical professor of hospitality, Paul O’Neill’s food and beverage customer service class participate in the meal service once each week. According to Sarah Lopreiato, a sophomore culinary arts and science major in O’Neill’s class who works in the front each Thursday lunch service, the class formally starts an hour before service to allow the students to prepare, and runs for four hours. The weekly lunch service began Feb. 1 this term. Lopreiato never had a chance to be a server before the class, but she seemed to be very comfortable with her role in the dining room. “It’s a little stressful at first, but you get used to it and they ease you into it,” she said about adjusting to the course’s challenges. She said this course has taught her how to communicate with the students in the kitchen among other skills. The situation modeled in the Academic Bistro is one that demands experiential learning. O’Neill explained how this dual class requirement (students have to take both classes at some point) offers foundational skills to students learning about culinary arts and hospitality. He says he loves to watch students come in very inexperienced and leave feeling confident in the front and back of the house. “My favorite thing is instilling confidence. I would say nine out of 10 students that come into this class every quarter, there’s always going to be students that are very scared to approach tables, to talk to tables, it’s not a very organic thing. So to make it as genuine as possible and to get past that hurdle … is great,” O’Neill said about the course. “It’s all about details. Everything from how you’re putting things down on the table to how gently you’re closing the door … those little details count,” O’Neill said, commenting on one of the main focuses for the students. And the details certainly were accounted for. Diners are required to make reservations for the lunch service each week. The menu, a set of three courses with two options for each course, offers a wide diversity and a guarantee that all food restrictions can be accomodated. After being seated and ordering a meal, diners are offered fresh bread before the first course. On Feb. 15, the options were fresh brioche, brioche with “everything” seasoning and biscuits. 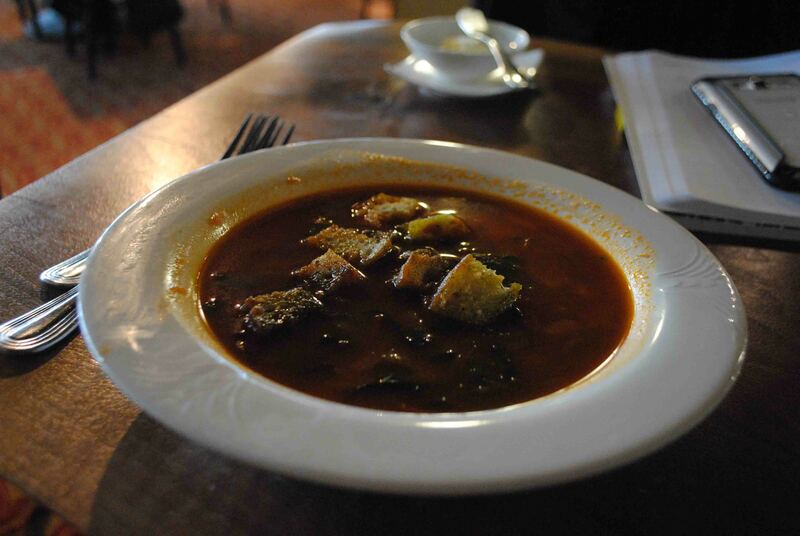 For the first course, the menu offered minestrone with cannellini beans, swiss chard and basil or a kale caesar salad with croutons and grana padano. The main course offerings included a roasted sirloin with potato puree and royal trumpet mushrooms or a sauteed halibut with marley mantecato and grilled zucchini. For dessert, the options were chocolate budino with drunken cherries and whipped creme fraiche, or honey semifreddo with espresso shortbread and citrus confit. Everything was well-balanced and fresh. The creative touches on every dish speak to comprehensive thinking and planning for the menu, and the ability for relatively simple dishes to taste unique and new reflects on the care that goes into planning and preparing the food. Everything was done with technical skill and an attention to detail that added a refreshing component to each bite and each course. Speaking to a few other diners showed that there are certainly some regular visitors to the Bistro. Lawrence Souder, a teaching professor in the department of communication, said that he’s been visiting the Academic Bistro for lunch for the past four to five years. He called the lunch service over those years “consistently good,” and mentioned that he likes to bring colleagues and clients there for meetings over lunch. “The food is excellent, it’s affordable and the wait staff is quite ernest,” he said. Another pair of diners was mother-daughter pair Lori and Rose Flavin. Rose is in the IT department at Drexel, and has come to lunch at the Bistro about four times in the past — she was bringing her mother for the first time. “I think it’s a great program and the food is delicious, the servers are good and it’s a great experience,” Flavin said. To attend lunch at the Academic Bistro, students can make a reservation here, and should be sure to bring either cash or their dragon cards to pay, as credit cards are not accepted.